Among the red russulas, Russula rubescens is distinguished by the fact that it "blushes"; its flesh and stem surface turn slowly reddish when sliced or bruised. And among the blushing russulas, it is distinctive in its pale, mottled red cap and habitat under eastern hardwoods. 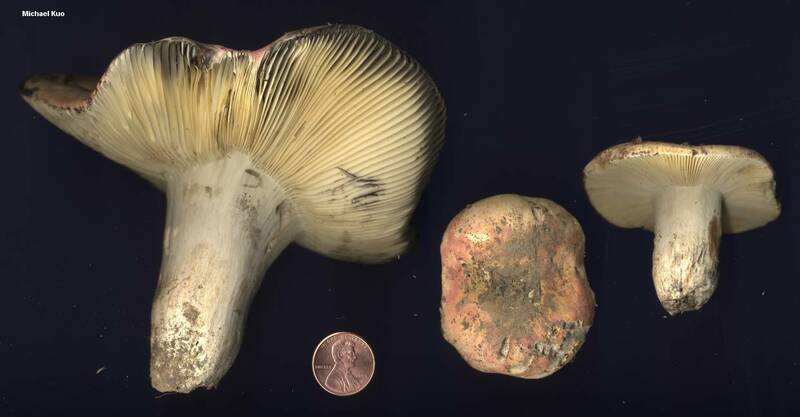 Like many blushers in the Russula world and elsewhere, Russula rubescens turns slowly blackish after blushing, though the change may take as much as an hour to manifest. Ecology: Mycorrhizal with hardwoods, especially oaks; growing alone, scattered, or gregariously; summer and fall; eastern North America. Cap: 4-10 cm; broadly convex when young, later flat or broadly convex; dry; more or less smooth; fairly evenly dull red, but sometimes mottled with whitish, yellowish, or olive areas; fading; the margin not lined or lined faintly and widely; the skin peeling halfway or more to the center. 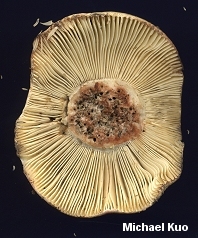 Gills: Attached or running very slightly down the stem; close or nearly distant; rarely forking; white to cream, eventually yellowish. 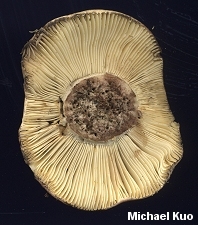 Stem: 3-7 cm long; 1-2.5 cm thick; more or less equal; dry; smooth; whitish at first, later discolored grayish; bruising reddish, then blackish over the course of as much as an hour. Flesh: White; bruising promptly or slowly reddish on exposure, then blackish over the course of as much as an hour. Chemical Reactions: KOH on cap surface orangish to yellowish. 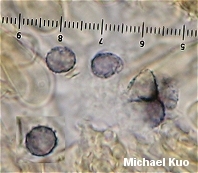 Microscopic Features: Spores 7-10 x 6-8 µ; broadly elliptical to subglobose; with generally isolated warts to 1.5 µ high; connectors rare or scattered. 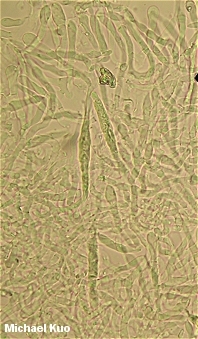 Pileipellis a cutis; pileocystidia cylindric to fusiform; ochraceous-reractive in KOH and positive in sulphovanillin. REFERENCES: Beardslee, 1914. (Burlingham, 1915; Beardslee, 1918; Kauffman, 1918; Saccardo, 1925; Kibby & Fatto, 1990; Phillips, 1991/2005; McNeil, 2006.) Herb. Kuo 08050307.